Some of the major players active in the rheumatology therapeutics market are Pfizer, Inc., AbbVie, Inc., Merck & Co., Inc., Bristol-Myers Squibb Company, Janssen Biotech, Inc., Amgen, Inc., Genentech, Inc., Novartis AG, Sanofi, and Takeda Pharmaceutical among others. These players are set to power the rheumatology therapeutics market in the near future. 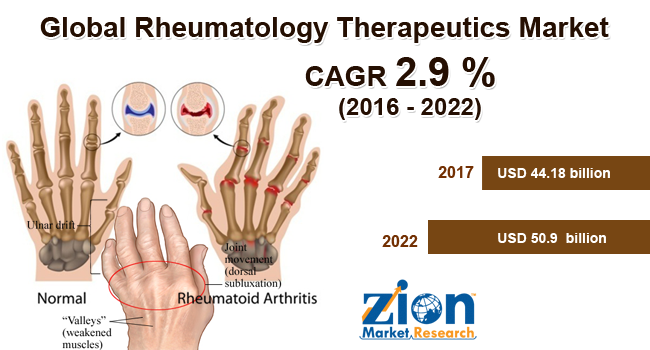 According to the experts at Zion Market Research, the global rheumatology therapeutics market was capitalized at almost USD 44.18 Billion in 2017 and is likely to cross almost USD 50.9 Billion by end of 2022, developing at a CAGR of 2.9 % from 2016 to 2022. The increasing burden of rheumatic diseases all over the globe is boosting the development of rheumatology therapeutics market. A broad number of drugs and biosimilars in the pipeline are powering the development of rheumatology therapeutics market. On the other hand, stringent rules & regulations and high capital investments in drug development are hindering the development of rheumatology therapeutics market. Technologically advanced goods such as biosimilars & biologics are likely to present lucrative growth avenues in future in the rheumatology therapeutics market. For example, in September 2018, Ronald F van Vollenhoven and associates reported in Lancet that UST (ustekinumab)—an interleukin-12 and -23 inhibitor—when added to normal therapy in SLE (systemic lupus erythematosus) patients, was claimed to be superior at enhancing laboratory parameters and clinical efficacy, boosting the rheumatology therapeutics market. Based on disease type, the global rheumatology therapeutics market is classified into osteoarthritis, rheumatoid arthritis, gout, lupus, and ankylosing spondylitis among other. Rheumatoid arthritis disease has high occurrence rates in comparison to any other disease and adds up for the lion’s share in global rheumatology therapeutics market. Based on drug type, the rheumatology therapeutics market is divided into analgesics, non-steroidal anti-inflammatory drugs, corticosteroids, disease modifying anti-rheumatic drugs, and other. Disease modifying anti-rheumatic drugs segment ruled the rheumatology therapeutics market in 2016 due to their elevated employment in the early phase of treatment. The distribution channel sector of rheumatology therapeutics comprises online pharmacy, retail pharmacy, and hospitals. The global rheumatology therapeutics market was ruled by North America and it grabbed an utmost share of total income generated in the rheumatology therapeutics market in 2016. The development in this area is credited to the soaring capital investments in the pharma industry and elevated geriatric population. Europe is another leading are for rheumatology therapeutics market after North America. Advanced healthcare infrastructure and increasing occurrences of rheumatoid diseases are responsible for the growth of the rheumatology therapeutics market in this region.